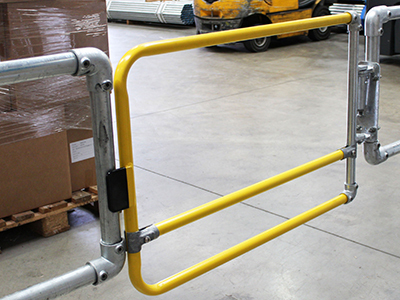 FastClamp® offers a range of self-closing industrial safety gates. Our gates are suitable for external and internal applications, and can be retro-fitted to existing structures. The gates are spring loaded to automatically close behind the user, to provide a safe environment and overcome the problem of human error. FastClamp® industrial safety gates provide a safe access to demarcated areas within factories, warehouses and loading bays. FastClamp® industrial safety gates are compliant with the requirements of EN 13374 Class A and EN ISO 14122 Part 3 & Part 4. Our gates have been extensive tested to ensure their durability and reliability. 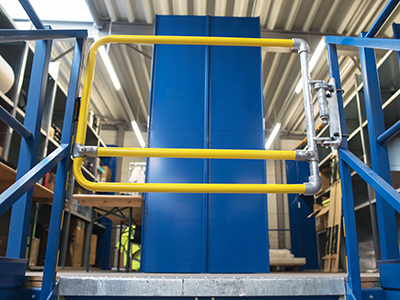 FastClamp® self-closing safety gates are supplied 1m wide and 2 x 0.9m wide for larger openings, either hot dipped galvanised or powder coated in safety yellow and can be easily trimmed to size on-site.